Loss of independence is often a major hurdle for our aging loved ones to overcome. At first, they may be unable to do physically demanding tasks alone. But as time progresses, they may find themselves unable to do everyday things, like driving a car, going up and down stairs, or simply walking around the block. The inability to do the things they once took for granted can often lead senior citizens to feelings of depression. But offering them back a portion of the independence can help to alleviate those feelings. Here are 4 ways you can help your aging loved one to feel more independent. Power scooters are an excellent way to help your elderly loved one regain some of their independence. They provide easy mobility without putting strain on the person’s body, but can feel less confining than a wheelchair. 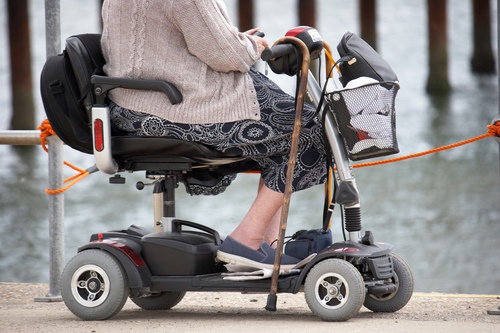 Often, a senior citizen will refuse the use of a wheelchair, because it makes them feel “crippled” in some way. But power scooters offer them more freedom without fear of the stigma they may have towards wheelchairs. Your loved one will once again be able to go wherever their family goes, without having to worry about taking frequent rests. Most of these improvements are quite simple, and don’t require major renovations. However, they can make an enormous different in the life of your loved one, and greatly improve their sense of independence and overall wellbeing. Some people, as they age, give up quickly on physical activity. Whether they stopped abruptly due to an injury, or gave it up altogether when they could no longer participate in their favorite activities, many senior citizens don’t get enough exercise. Encouraging your aging loved one to engage in regular physical activity can have a number of benefits that impact their sense of independence. First, exercise releases endorphins and helps to promote proper blood flor throughout the body. This can help to improve the person’s mood significantly as compared to sitting at home all day. Whether it’s a walk around the blog, water aerobics, or simple chair exercises, reminding your loved one of the things they can still do on their own can help them to feel more independent. Plus, physical exercise will keep their body stronger and healthier for longer, so they can actually maintain more of their independence over the years. As your loved one ages, they might not be able to complete simple, everyday tasks on their own. This can be incredibly frustrating for them. But rather than stepping in and simply doing things for them, try to find different ways for your loved one to complete these tasks independently. For example, your family member may no longer be able to go to the grocery store on their own. Instead of going to the grocery store for them every week, show them how to order groceries online, and have them delivered to their home. If they’re struggling with household chores, consider getting a robotic vacuum to help keep things clean. If they’re having a hard time preparing their own meals, find some simple slow cooker meals they’re still able to prepare on their own; or, prepare meals for them that can be stored in the freezer, so they can still do some of the meal prep independently. By adapting everyday tasks in this way, you encourage your loved one to maintain some part of their independence. This can have an enormous impact on their mental state and sense of worth. Even if they have to change the way they do things, being able to do these everyday tasks on their own will help them to feel more independent. And that sense of independence is one pivotal way that we can help our aging family members to maintain their personal sense of dignity. Medical Xpress is your one stop shop for your medical supply needs. Visit Medical Xpress today, at one of our medical supply locations in texas.